I’m so pleased with the results after just one session. The methods used gave quick effective results. We have a clear plan to continue forward. Both me and Honey are happier already working throgh a couple of things at a time and knowing how to progress further. I would 100% recommend this service. Hello, I am Gina Hinsley. Welcome to Bark Busters Home Dog Training Bath, Trowbridge & Chippenham ares, where I am your local behaviour therapist. I am a dog lover and have been the proud owner of several dogs throughout my life. Like you, I love dogs and want the best for them, including a relationship built on mutual trust and respect, where we all know what is expected of us. However, the availability of conflicting advice and opinions on training systems can leave you confused. Communication is essential and sometimes we can get it wrong which is why we make very little progress. I was introduced to the Bark Busters system of communication and training which realises how important it is to understand a dog’s system of communication and to use it in a consistent way. 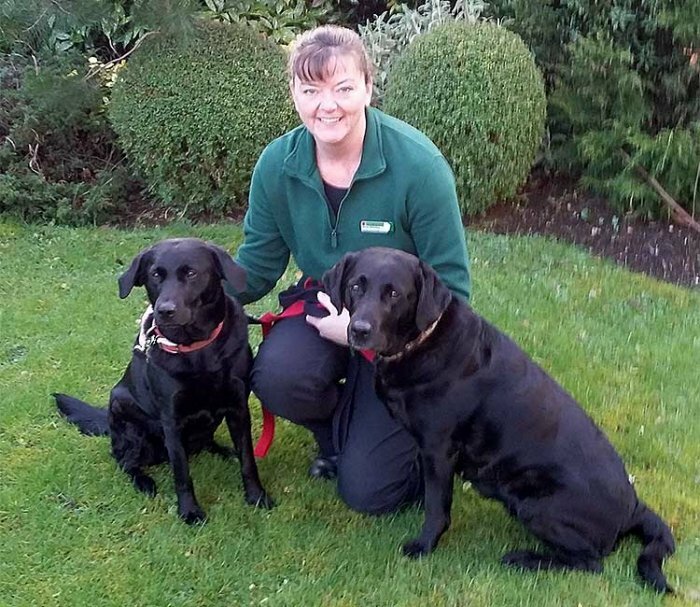 I was delighted when the opportunity arose for me to train with Bark Busters to fulfil my dream of working with dogs and their owners as a home dog training therapist. My background in the corporate arena is also useful to me as I am equipped to handle a variety of situations, people and problems. My skills in supporting and helping others will give you the confidence to help train your dog. Together we will discuss the unwanted behaviour you are seeing from your best friend, and work on a tailored plan to eliminate the bad behaviour and get your relationship back on track. Whatever problems you are experiencing with your dog I am confident I can help you. Our communication system is fast and effective, and will help you to communicate with your dog in a new way, using voice tone and body language and without the need for gadgets or gimmicks. As I have already expressed, communication and consistency are key to success. You will quickly learn to use our system and from that will come your confidence to use it consistently. How does our training create happy dogs and happy owners? The training is arranged at a time to suit you. I will visit you and your dog in your home where we will chat about the issues you are having. Firstly, we will uncover the reasons for the unwanted behaviour, then we will put a tailor made plan into place. Before I leave your first lesson, I will have coached you in our communication methods, and given you lots of practise. Often owners see a change in their dog’s behaviour by the end of the first lesson, and you will know how to build on that. If your problem is simply that your dog pulls on the lead and ruins your walks together, I can help you with that. If you are struggling with more serious problems like aggression, barking, separation anxiety or any combination of issues, I can help with those. I will show you how, by changing how you interact with your dog, you can start to eliminate the unwanted behaviour. I can also help if you would like to get off to a good start with a new dog, a rescue dog, or a puppy. Our puppy training is gentle and fun and gives you all you need to know to have a happy, healthy puppy. You will be prepared in advance for potential issues and know how to deal with them. Whatever age, type, or size, and whatever the problem, feel free to get in touch and I will be delighted to help! Our unique Support Guarantee means that, after our first lesson together, I will continue to return to you and your dog free of charge to support you through your programme for the term of the guarantee. Average rating 4.9 out of 5 based on the last 80 reviews out of 80. Training went very well, learnt loads of information and was easy to put to practice. Very easy to understand with everything explained fully. Cannot comment on results yet as too early but making progress. Easy clear basic common sense instructions, with immediate results. Myself and my partner took turns in training. I wouldn’t have believed it if I hadn’t seen it with my own eyes. It’s only the start and I’m sure it will get harder, but it has given us hope we will work through this.